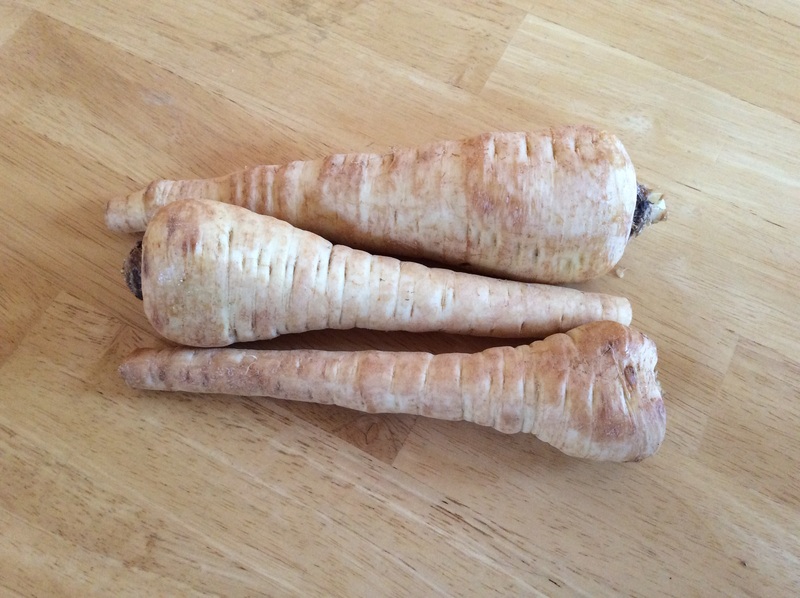 Parsnips are the same size and shape as carrots, but have a totally different flavor. They look like a white carrot with a creamy texture and sweet flavor. 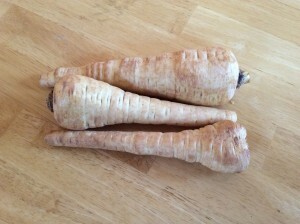 They have a woody core, the larger the parsnip, the tougher the core will be. Parsnips can be roasted, pureed, boiled, steamed, or mashed. They can be used in recipes that call for carrots. For those storing the beets, carrots and parsnips, Farmer Jamie reminds us that a good way to preserve your root veggies is to give them a good rinse and pat dry when you get them home. Toss them in a ziploc bag in the fridge, and this will help to avoid the wilty wobbly veggies. Separate greens from the veggies right away too (such as with the radishes). 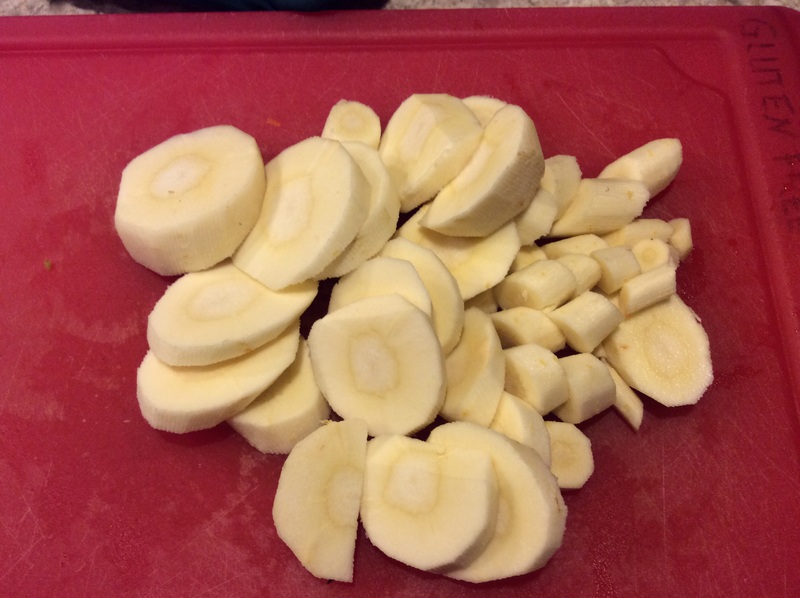 If the bite of a radish is too much, you can cut them and leave them soaking in water in the fridge for a few days, and this will reduce the bite while keeping the veggies crisp. These roots store for longer periods in a root cellar. Click on “Carrots” to see homemade root cellar options. Roast em up with other root veggies, drizzle with melted butter and maple syrup! A great comfort food to get you through the winter doldrums (or a depressing Superbowl). This is a very flexible recipe. 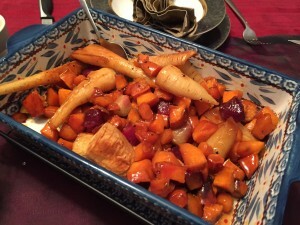 Turnips, small diced sweet potatoes, and carrots would also work as your primary veggies. Substitute the beef for ground pork, chicken, goat (chorizo! ), turkey or tofu (though I’d recommend adding the latter about 30 minutes from the end of cook time). As always, make it your own! No parsnips? Try it with turnips! Comfort food! When you need a hearty dinner turn to winter veggies and a hunk of crusty bread. I used parmesan cheese in the dish but I also sprinkled a little bit of sharp cheddar on top after it came out from under the broiler. A favorite of Sarah’s, this dish is crunchy yet creamy, it’s salty, sweet, and fresh. It’s done in 30 minutes, only one pan is used, and it plates as a beautiful dish. Such an awesome way to breathe life into those leftovers. This recipe is not limited to holiday dinner leftovers. It’s a flexible dish depending on what leftovers you have, so as always, make it your own. Bake up some scorn squash for a layer, potatoes, root veggies, poultry or shredded beef, use your imagination and enjoy the results! A beautifully prepared eye round roast with a delicious and easy parsnip puree. Chicken stock can be used to thin down your puree if you choose. Part 3 of a roast chicken post- make these delicious pot pies using the leftover chicken from part 1, and the gravy from part 2. A quick, easy and delicious dinner! Delicious vegetarian fritters, serve with sour cream or applesauce. This soup is all about seasonal flavors, wintery, thick and filling. It starts by roasting the veggies to get the most flavor out of the root.